As noted in a new report by Reuters, the popularity of a $50 device called the "notetel" in North Korea symbolizes a shift in that country. As noted in the report,"Notel or 'notetel' - the name is a uniquely North Korean word combining 'notebook' and 'television' - are easily found on the black market for around 300 Chinese yuan ($48), and are also available in some state shops and markets.The device was legalized last year, according to defector-run news outlets in Seoul - one of many recent measures taken by the state to accommodate grassroots change. The new rules, however, also require North Koreans to register their notel, enabling authorities to monitor who is most likely to be watching banned foreign media." Later on the report notes that "The low-voltage notel differs from the portable DVD players of the late 1990s in that they have USB and SD card ports, and a built-in TV and radio tuner. They can also be charged with a car battery - an essential piece of household equipment in electricity-scarce North Korea." A North Korean defector, quoted in the Reuters report, said the device's multi-function nature makes it easier for users to get away with watching illegal material. "To avoid getting caught, people load a North Korean DVD while watching South Korean dramas on a USB stick, which can be pulled out," he said. "They then tell the authorities, who feel the heat from the notel to check whether or not it has been recently used, that they were watching North Korean films". " Fascinating information, even if anecdotal. I wonder about the significance of "Sansung" on the display screen of the above graphic, but I doubt it is any coincidence. 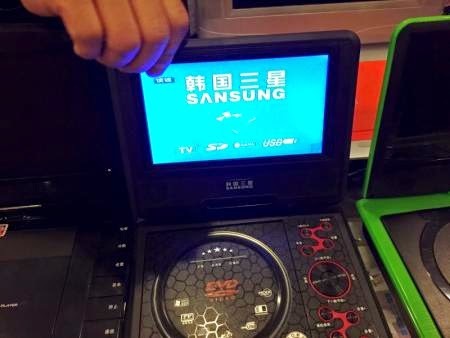 The North Korean public is by now well acquainted with Samsung Electronics!